I turned up at my permission today to find someone else swinging away at the top of Field 3. I couldn’t see his features in detail but the silhouette of a Deus is unmistakeable. And it was something of a shock. When I spoke to the farmer recently he didn’t mention anything about another detectorist on the land. We spent an hour or so sizing each other up surreptitiously from opposite ends of the field, during which time he made a number of trips back and forth along the far edge but only seemed to dig one hole. After about an hour he started to make his way nonchalantly towards the gate, having timed his run to ensure that there was no prospect of us meeting unless I sprinted across the field. Once he was out of sight I wandered over to where he’d been digging to see if he’d filled the hole in. Fortunately he had, making a decent job of it in fact. 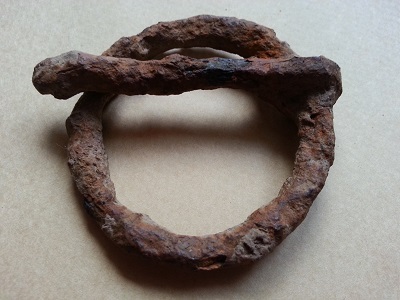 Finds: 1 iron harness buckle, 6cm diameter.